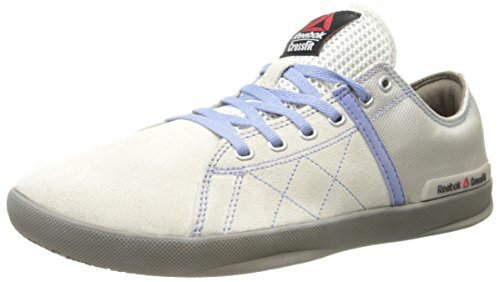 Are you looking for a pair of affordable workout shoes that are ideal for weightlifting? Then the Reebok CrossFite Lite shoes should be at the top of your list. Read our buying guide packed with information to help you decide if they’re the right shoe for you. The Reebok Women’s Lite Lo TR Training Shoe is a solid weightlifting shoe at an extremely reasonable price. If you’re looking for a training shoe that you can use for those days at the gym that are only weights because you don’t want to wear out your expensive shoes, these ones are it. Although they are cheaper than some of Reebok’s more expensive CrossFit Shoes like the CrossFit Nano Series, they are built to the same exacting standards. The unique feature of this CrossFit shoe is how flat it is. There is nothing in the way of arch support, making it an excellent shoe for lifting. There is an extremely stable, firm platform and there is some excellent grip on the bottom. Overall, if you’re looking for a solid, nice-looking shoe for lifting some weights or a casual walk around town, the Reebok CrossFit Lite Training shoe makes a nice choice. They also have a high-top version of this shoe, which we’ve reviewed here: Reebok CrossFit Lite TR Training Shoe for Women. However, you should be warned! They are most certainly not suitable for cross-training workouts or running. The heel to toe drop is zero, which will make them very uncomfortable to run in. Just looking at them and thinking about running more than a few steps will probably give you the “No” feeling! So don’t think that these are going to be good for hitting the treadmill for a few minutes after lifting a few weights. They won’t be. Check out these top-quality running shoes suitable for CrossFit if that’s what you’re looking for. Not ideal for anything other than weightlifting, or a casual walk around town. Heel not comfortable for some as they noticed rubbing on the achilles. If you’re looking for a shoe that will excel when lifting, the Reebok Women’s CrossFit Lite Lo TR Training Shoe might just be what you’re looking for. It’s extremely flat (no arch support at all! ), which makes it the perfect shoe for giving you a stable platform to hit those weights hard. It’s also extremely reasonably priced and comes in some interesting colors and designs. We also love this low-cut version, which is trendy enough to be worn for around town. This popular shoe from Reebok is one of the Best CrossFit Shoes for weightlifting and gets a solid two thumbs up here! What are your thoughts about these top-quality CrossFit shoes? Leave a comment below and let us know what you think.